This small breed has either a white and brown or white, brown, and tan long silky coat that trails across the floor if not groomed. Their fur is straight and often naturally parted in the middle of both their head and body. They are known to hold their heads up high, giving off a sense of self importance. Their skull is flatter on the top as opposed to rounded, they have a scissor bite, and they have V shaped ears that are covered by long fur. Their bodies are small and compact, with an almost even line from their shoulders to their behinds. When looking at their legs, they appear straight from behind but a side view shows slightly bent front legs. They have white toenails and the pads of their feet are a chocolate brown color. Their tail is also covered with long fur and is known to be slightly curved over their bodies. These dogs are intelligent yet independent. This combination makes the breed bold and able to think for themselves. They can be a bit stubborn or feisty when it comes to listening to commands because they know what they want. They are also courageous when it comes to new things and are not afraid to figure things out on their own. Even with their strong personality, the Biro is still friendly and loves to be near humans. They crave affection and are quite happy with their human companions. Since this breed is relatively new, less is known about the health. Like other small terriers, be conscious of what they eat as they can experience bloating or an upset stomach more easily than other breeds. They can also experience Distichiasis which is when there are too many eyelashes growing around their eyes, usually out of the same hair follicles. Also be wary of Legg-Calve-Perthes Syndrome within this breed. This is when there is not enough blood traveling to their hip joint which can result in collapsed cartilage or a cracked leg. These small dogs would fit quite well in an apartment, house, or pretty much any living situation. They do not require too much room as they are a small breed, but they still require a daily walk. The Biro does not need substantial exercise, but they still require a daily walk to be mentally and physically balanced. Indoors, they will please their owner by performing tricks and they also love to explore outside. Because these dogs have a relatively long coat, it is important to brush them at least once a week. They will also need more baths than regular dogs because they are more prone to getting their fur dirty. Trim their hair when necessary, especially if their hair is getting in the way of their eyes. In Hunsruck, Germany in 1984 a couple by the name of Werner & Gertrude Biewer created the first Biewer through the occurrence of a recessive piebald gene in their purebred Yorkshire terriers. 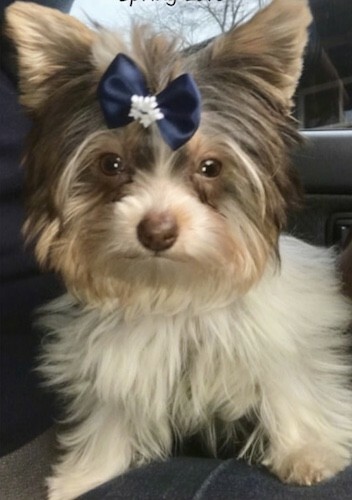 Over the next several years, the Biewers bred for the piebald gene and produced blue, white and gold Yorkshire Terriers that bred true to their color. It was not until 1989 in Germany when the first club, Allgemeiner Club der Hundefreunde Deutschland.e.V, (ACH.e.V) to accept Mr. Brewers’ “Biewer Yorkshire Terrier” as a distinct and new breed. On May 23, 2003 a dog fancier, Dagmar Przystaw, opened the first Deutsche Biewer Club, International Biewer Yorkshire Terrier Club, (IBYTC) and in September of 2004 opened another Biewer Club, the International Biewer Club, (IBC). The Biewer made its first debut in North America mainstream in 2003 by a active canine fancier, Donna Hall, who brought the first Biewer from Germany and founded the first American Biewer Club, (ABC). The first two Biewer’s to enter the show ring in the United States were a male called “Decoration” and a female called “Delux” both imported from Germany at the same time. The ABC and its membership stayed true to the original Biewer Yorkshire Terrier Breed Standard set forth in Germany under UCI/RVD (reference number of 00/490). They were partners with the original German Biewer Club. The North American Kennel Club, (NAKC) also chose to follow the Standard submitted by Donna Hall and the American Biewer Club. Meanwhile in Germany in the winter of 2004 on December 1st a female Biewer Yorkshire terrier, “Alisha vom WasserschloBchen” owned by famous German breeders; Roberto Krah & J. Lutz of Art of Highclass Kennel, whelped (4) four-puppies, three-puppies were Biewer(s) and the fourth was a female they named, “Artois of High Class Relight My Chocolate Fire”, a puppy who had a chocolate pattern on a white background with a tri-colored head of chocolate, white and gold, instead of the standard pattern; blue/black, white and gold. The father of this litter was a famous Sire, Champion “Uz von der Elsteraue” winner of a great number of awards. Then six weeks later on January 14, 2005 in the Kennel, Lightning Showboy whelped another female puppy named, “Little Prinzess from the Lightning Showboy”, owned by breeders, Birgit Rosner and N. Polak. The mother of this litter was “Ailine von Alktomany”, who was the daughter of the already mentioned, Biewer, Alisha vom WasserschloBchen. The father of this litter was the same Biewer, CH Uz von der Elsteraue. The breeders of both Kennel’s took great interest in the new coat color and decided to continue breeding and strengthening this piebald chocolate Yorkshire terrier to breed true to their color. In late 2005 Birgit Rosner and Roberto Krah decided to conjoin their first two initials of their first names, to name their newfound Breed, the BIRO. The color of this Breed was to be (in German); Schoko-WeiB-Gold, translated to English to be; chocolate-white-gold. Unfortunately, Ms. Rosner and Ms. Polak stopped breeding some years ago, therefore the only original Kennel left in Germany is, Art of Highclass. A great support of the BIRO breeds’ establishment was given again by the already mentioned Dagmar Przystaw. The first Club to register the BIRO was “ACH-L/IBC”, President-Dagmar Przystaw and the second Club was Deutsches Hundestammbuch, (DHS) German Dog Stud book. The first female, Artois of High Class Relight My Chocolate Fire, was the first BIRO to become registered in the World to the IBC in Germany in 2005 and shortly thereafter was registered with the German Breeders Union. The BIRO mainstreamed to the United States in 2005 and was first registered with the Biewer Biro International Registry (BBIR), followed by the National Kennel Club (NKC), the American Rare Breed Association (ARBA), the Continental Kennel Club (CKC) and by the Biro Biewer Golddust Club, Inc., (BBGC).